And when you buy the commercial version of the Brannt family, you can start to explore your software’s character map for OpenType replacment features, plus there’s a layering effect to simplify the breakdown of the colors. By selecting from the style menu, the chiseled version of Brannt can be assembled with a background outline, the main glyph outline, and the foreground chisel effect. Stack up these three layers, set the colors, and simply, GO-!!! Race1 Brannt NCV font contains 224 defined characters and 87 unique glyphs. 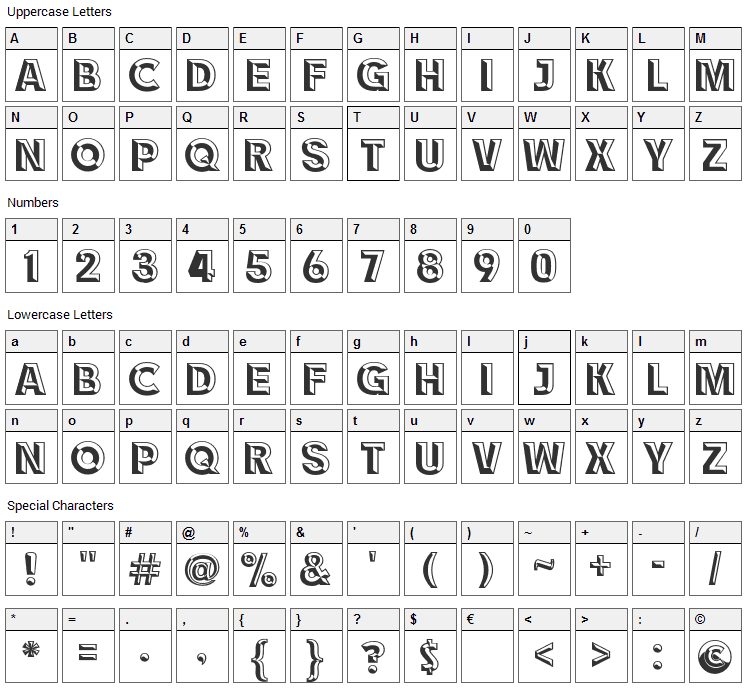 The font contains characters from the following unicode character ranges: Basic Latin (93), Latin-1 Supplement (96), Latin Extended-A (10), Latin Extended-B (1), Spacing Modifier Letters (2), Greek and Coptic (1), General Punctuation (16), Currency Symbols (1), Letterlike Symbols (1), Mathematical Operators (1), Private Use Area (1). 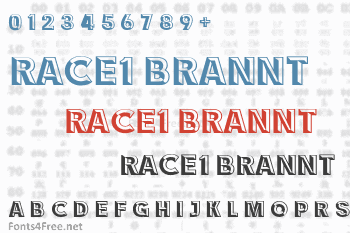 Race1 Brannt NCV is a fancy, retro font designed by Fontry. The font is licensed as Free for personal use. You can download and use the font free for personal projects. For commercial projects please refer to the license file in the package or contact the designer directly from thefontry.com.